Berlin is unlikely to cave in to Washinton's pressure, Sergei Kalashnikov, first deputy chair of the Federation Council Committee on Economic Policy, told Sputnik, commenting on US President Donald Trump's recent attacks on Nord Stream 2. "It's pretty clear for everyone that at the core of [Trump's] statement lie the commercial interests of American businesses," Kalashnikov underscored. "The US is trying to palm its own liquefied gas — which is far more expensive than Russian natural gas — off on Germany and Europe in general." Earlier on July 11, the US president subjected Berlin to harsh criticism during his breakfast with NATO Secretary General Jens Stoltenberg in the US Embassy in Brussels. According to Trump, it's inappropriate that Germany is "making massive oil and gas deals with Russia." ​He also expressed his dissatisfaction with the fact that former German Chancellor Gerhard Schroeder is a chairman of the board of Nord Stream AG, an operator of pipelines delivering gas from Russia to Germany. Apparently, the US president was not aware of the fact that the pipeline project was initially proposed by Russian President Vladimir Putin and Chancellor Schroeder in 2005. "We are supposed to protect you against Russia but they [Germany and other European countries] are paying billions to Russia," the US president said. "Germany is totally controlled by Russia." German Chancellor Angela Merkel immediately responded to Trump's remark: "I have experienced myself how a part of Germany was controlled by the Soviet Union. I am very happy that today we are united in freedom, the Federal Republic of Germany. Because of that we can say that we can make our independent policies and make independent decisions." "We are not prisoners, neither of Russia nor of the United States. We are one of the guarantors of the free world and that will stay that way," German Foreign Minister Heiko Maas said on the sidelines of a NATO summit. For his part, Jens Stoltenberg urged Trump to keep the Russian gas pipeline project out of the NATO summit agenda. "There are different views on the Nord Stream pipeline, that's well known," Stoltenberg said, as quoted by Forbes. "But it's not for NATO to decide, this is a national position." The Trump administration has repeatedly attacked the Nord Stream 2 endeavor, even threatening to impose sanctions on European energy giants involved in the project, namely, ENGIE, OMV, Shell, Uniper and Wintershall. Washington's two main arguments against the project are European energy security, and Ukraine's potential economic losses. However, neither holds water. Moscow was supplying gas to Western Europe even during the Cold War regardless of the Reagan administration's vocal displeasure. USSR-European cooperation did not undermine NATO's security, but in some sense facilitated the thaw between the two rival blocs. On the other hand, the Kremlin has repeatedly highlighted that the Ukrainian route will continue operating if it corresponds with the economic interests of the parties involved. 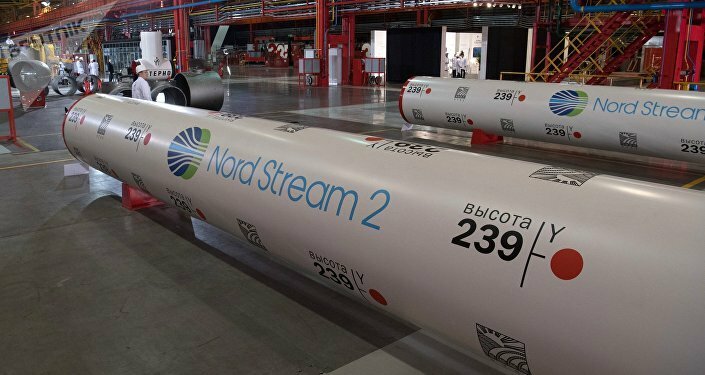 In May 2018, Forbes economic observer Kenneth Rapoza predicted that Europe would continue ignoring Trump's sanctions on Nord Stream 2 no matter what. "Gazprom was sanctioned by Obama in July 2014, but not by Europe. Europe relies on Gazprom as its chief foreign source of natural gas," Rapoza wrote. "This is particularly true in Germany, where Russian gas accounts for nearly a third of supply." The journalist recalled that in August 2017, Washington had introduced discretionary sanctions against Nord Stream 2 and in February 2018 added Gazprom CEO Alexei Miller to its sanctions list. "But Europe is not giving up on them. Not the French. Not the Germans. Not the Brits, either," the economic observer highlighted. As of yet, Denmark remains the only European state that hasn't given the "green light" to the pipeline's construction in its territorial waters. Earlier, Germany, Finland, and Sweden provided Nord Stream 2 AG, the pipeline's operator, with the necessary permits. Presumably, Copenhagen's hesitance could be explained by Washington's pressure. However, Gazprom has already signaled that it has a Plan B if the Danish authorities try to stop the construction of the pipeline. "The construction of the Nord Stream 2 offshore section will begin in strict accordance with the schedule, in the summer of this year…. Yes, there is still a problem with receiving a permission from Denmark. But there is also a plan in place for solving this issue," Gazprom CEO Alexey Miller told the press on June 29, adding that Gazprom's gas exports to Europe may reach a figure of at least 205 billion cubic meters in 2018.